Much like a magpie, pretty shiny things capture my attention with a silly amount of ease. Shamefully, festive-themed coffee cups, pajamas dotted with reindeer and candles scented with cinnamon, ginger and winter berry end up in my arms quicker than you can say “a toffee nut latte please”. I think that’s probably why I love Christmas so much. Aside from the guarantee that you will be surrounded by loved ones on the big day, things like wreaths on doorways, miles of chintzy tinsel and walls of tree ornaments in Paperchase give me that Christmassy warm cosy feeling. 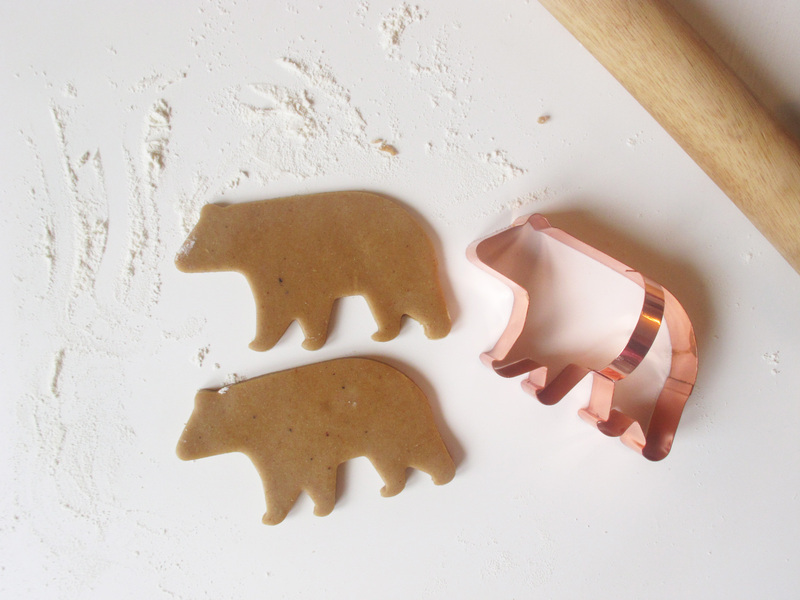 It was the same when I spotted this copper bear cookie cutter and instantly knew I wanted to make rows and rows of gingerbread polar bears in a snowstorm of royal icing, sparkly silver cake decorations and plenty of sweet spices. 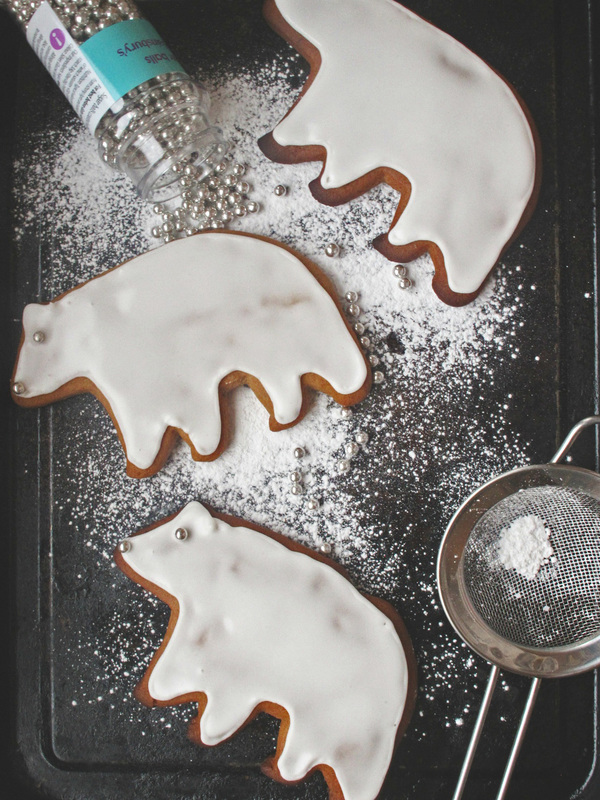 I mean, what’s more cheering than a polar bear biscuit with a cup of tea as it snows? 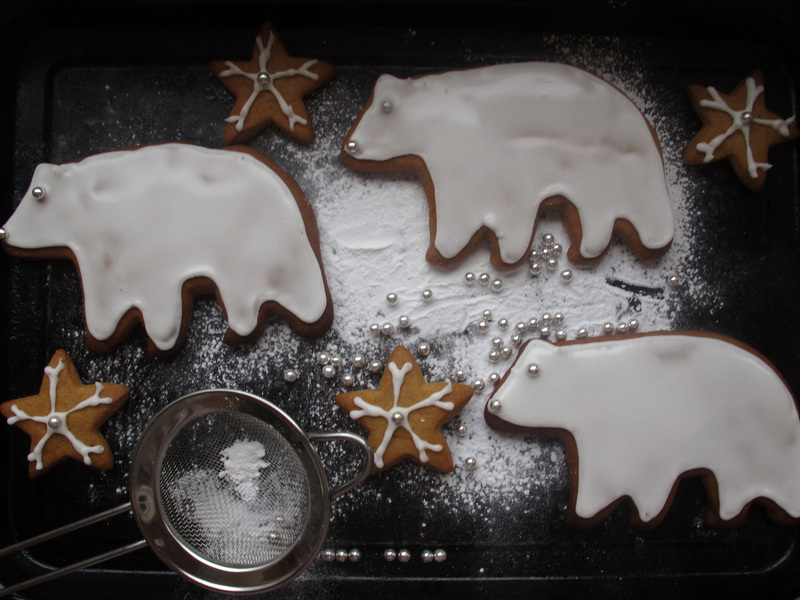 As these photographs of my attempts at gingerbread snowflakes can attest, piping isn’t exactly my forte but cheerfully, all you really need to ice a polar bear biscuit neatly is a (slightly wobbly) block outline. Then you simply spoon in a ribbon of royal icing, pooling into the edges with a little teasing like a blanket of crisp white snow. I love the simplicity of the little silver eyes and noses, it makes the pack seem rather expressive as they explore the icing sugar and wobbly gingerbread snowflake land I created for them. 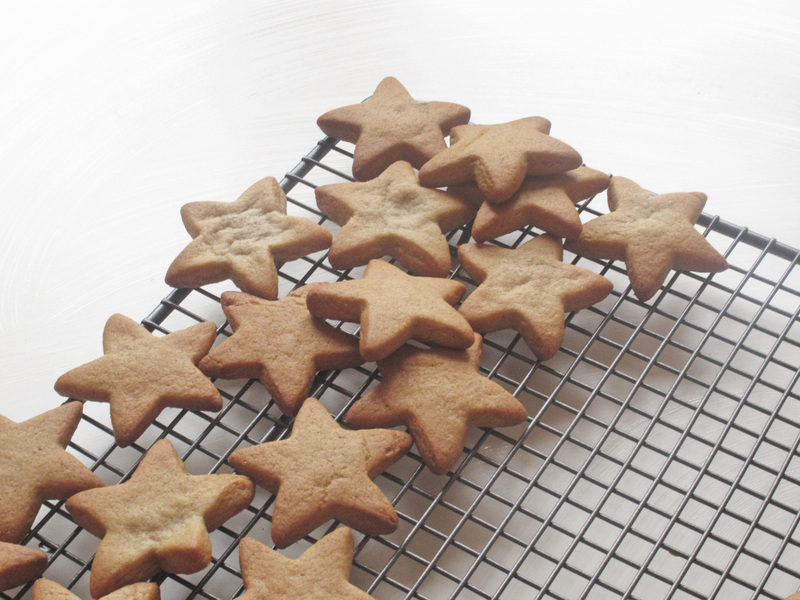 This gingerbread recipe is much lighter than what I would usually bake, omitting the use of sticky treacle or dark sugars to create a softer biscuit with warming but not overpowering spices. Left to air dry completely so the icing doesn’t meld the bears together, they look incredibly pretty in a clear treat bag tied with ribbon, perfect for gifting or festive bake sales that are sure to crop up in the next few weeks as we count down to the big day. Until then, I’ll be baking batch upon batch, nibbling away with The Muppets Christmas Carol on, winter berry candle flickering away while I stay cosy in festive-themed pajamas. I really do love this time of year. Of course, you can use any cutter you like but be mindful of baking time - larger cutters with require a few more minutes in the oven. Similarly smaller shapes will need less time. Place the golden syrup, honey, butter and sugar in a saucepan and stir over a medium heat. Once melted together, take off the heat and cool for around 3 to 4 minutes. 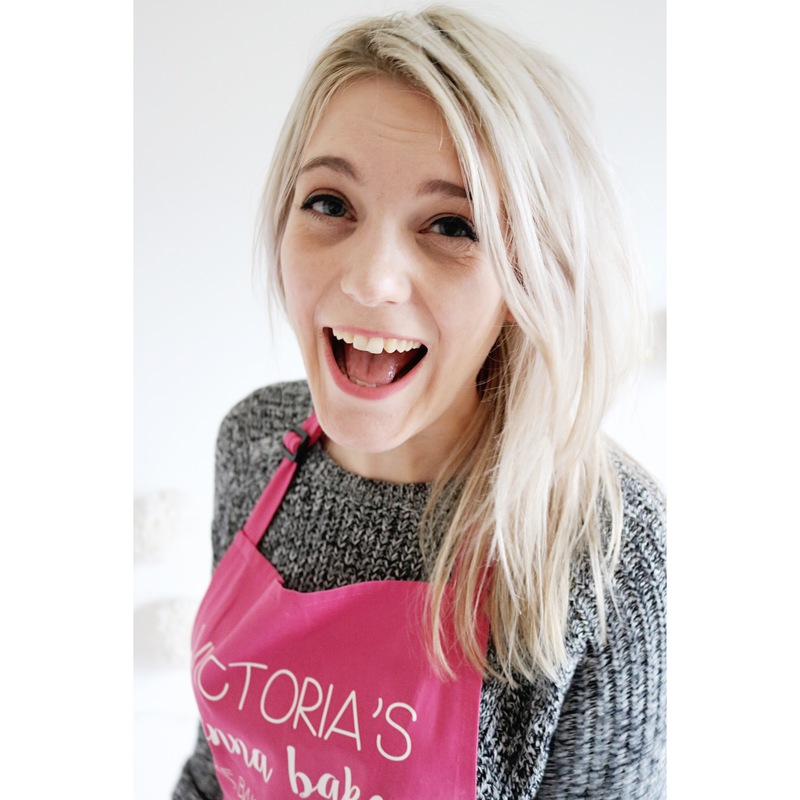 Meanwhile whisk together the spices, bicarbonate of soda, salt, pepper and flour in a bowl. Pour the sugary buttery mix into the bowl and add the egg, stirring to a sticky dough. Wrap tightly in clingfilm and place in the fridge for at least 30 minutes before using. I left my dough in the fridge overnight then took it out to come up to room temperature before using. Preheat the oven to 200oc/180oc fan and line a large baking tray with baking parchment. Flour a clean work surface and cut the dough in half (this makes it easier to roll). Sprinkle the dough and a rolling pin with flour and roll to the thickness of a pound coin. Using a bear cutter (I bought mine from Sainsbury’s) cut as many shapes as possible from the dough, rerolling the scraps and then using the second half of the dough. Space the bears well apart on the tray (I baked 6 bears at a time) and place in the oven to bake for 5-6 minutes for soft and chewy gingerbread or 6-7 minutes for harder biscuits. Remove from the oven once golden and cool for a few minutes on the tray before transferring to a wire rack to cool completely. Repeat with the remaining bears - I also cut a few stars to make snowflakes - these only took around 4 minutes to bake as they are very small. Once the biscuits have cooled, make the royal icing. In a bowl whisk together the icing sugar and enough water to create a thick icing roughly the consistency of toothpaste. I used roughly one tablespoon and 1 teaspoon of water to get this consistency. Fit a round piping nozzle in a disposable piping bag, cutting the bag around half a centimetre from the tip then spoon in the icing. Pipe an outline around the outside of each bear and leave to air dry for about five minutes. 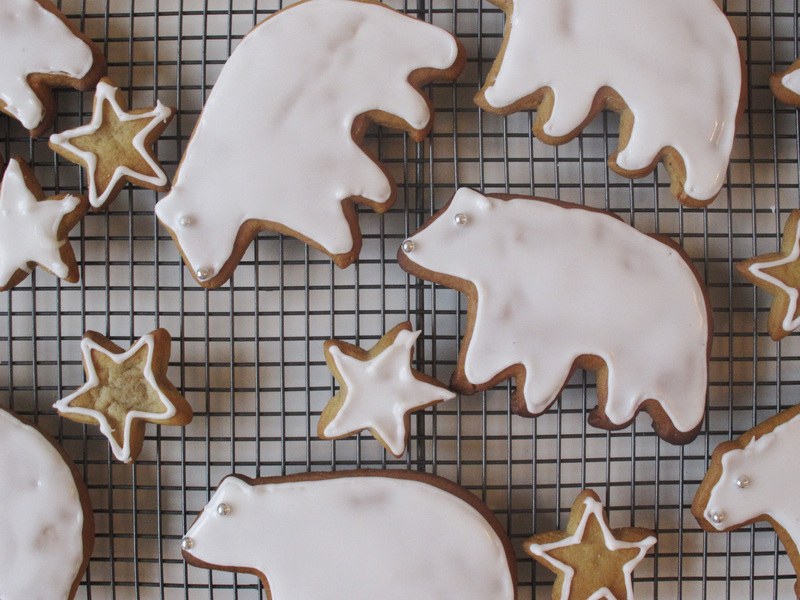 If you made any star biscuits, pipe lines and decorate with silver balls to create snowflakes or pipe around the outline to flood like the polar bears. Once each biscuit has been outlined, snip the tip off the icing bag and squeeze the remaining icing back into the bowl, adding around another teaspoon or so to water down the icing. you should be able to spoon some icing and drop back into the bowl in ribbons. 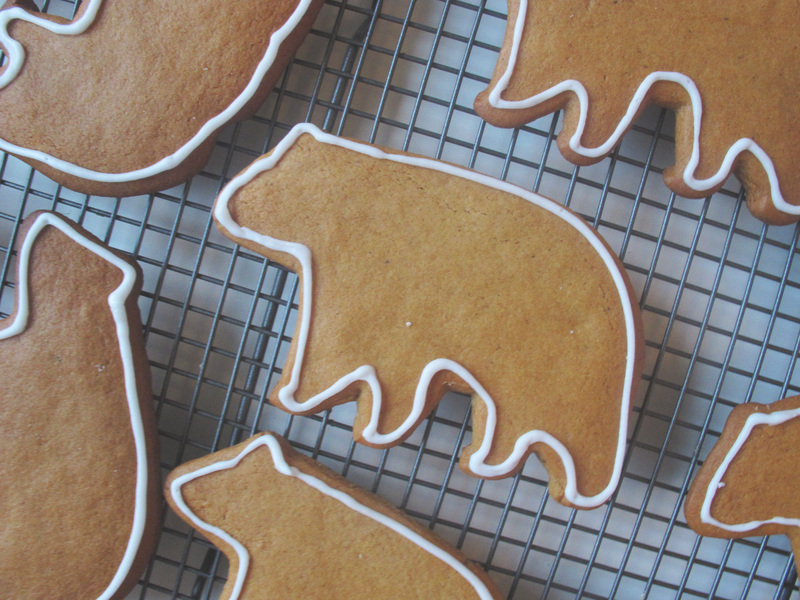 To flood the biscuits, spoon roughly a dessert spoon of icing in the middle of each bear and using a teaspoon, toothpick or skewer, tease the icing into to corners to create a neat polar bear. Push two silver balls into the icing to create an eye and nose then repeat with the remaining biscuits. If you run out of icing, simply make up another smaller batch to the same consistency. Leave to dry and store in an airtight container. These gingerbread cookies look so cute, and scrumptious! Perfect icing!